After last nights lacklustre meal, tonight’s is a little more exciting. 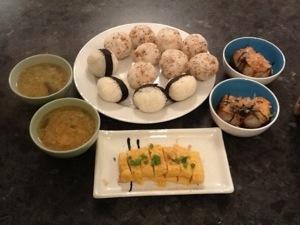 2)tenkasu (tempura scraps), bonito flakes, sesame seeds & soy sauce(thanks again to the wonderful book Simply Onigiri). 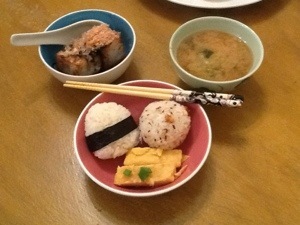 Also here, we have agedashi tofu, miso soup and rolled egg thingy (tamagoyaki) Itadakimasu!